For a liberal arts college, Central College sends a heck of a lot of graduates into health professions these days. You might expect a bunch of science, psychology and athletic training majors to choose that path. But at Central, even majors in business, sociology, Spanish, cultural anthropology and more choose such programs. It’s a relatively recent trend. So we decided to investigate. Five Central graduates celebrated together at the University of Iowa white coat ceremony earlier this year. Left to right: Ashley Radig ’16, Sam Palmer ’17, Abby Fyfe ’18, Nick Lind ’06 and Andie Arthofer ’17. A well-rounded, interdisciplinary liberal arts education that develops flexibility and creative problem-solving. Personal attention, support and mentoring from professors. Experiential learning via community service, internships and job shadowing. Teamwork and leadership experience in both academic and co-curricular activities. Many of those we talked to said they found graduate study in health care much like their Central education: challenging, immersive, multi-disciplinary, interactive and rewarding, with academic, real-world and people-to-people aspects. Many felt better-prepared than their grad school classmates who had a lecture-based university education. Their advice to current Central undergraduates? Take advantage of all that Central has to offer rather than concentrate on only prerequisites to graduate study. 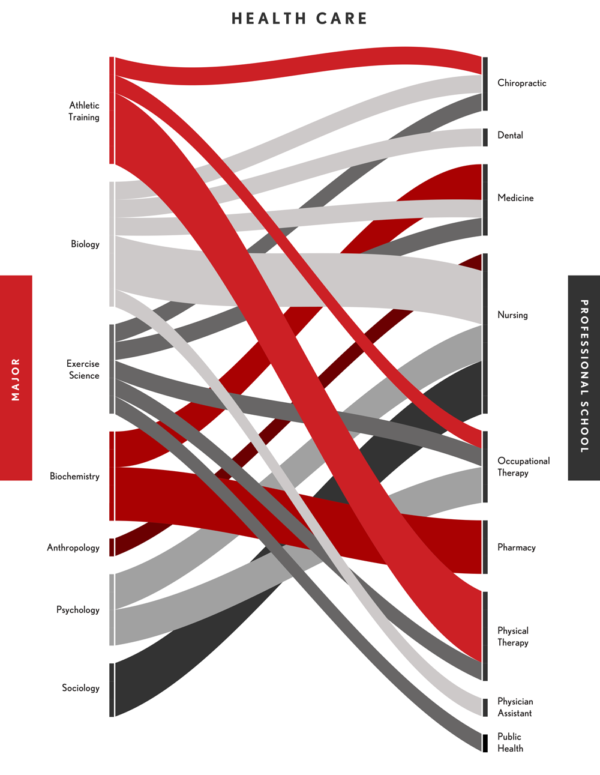 This diagram tracks Central alumni whose majors led them to pursue health care graduate programs. The thickness of the connecting lines correspond to the relative number of students. AFFILIATE RELATIONSHIPS WITH HEALTH CARE GRADUATE PROGRAMS at Allen College of Nursing, Palmer College of Chiropractic and Washington University in St. Louis give Central students a leg-up into programs at those institutions. HIGH ACCEPTANCE RATE AT THE UNIVERSITY OF IOWA’S TOP-RATED HEALTH PROGRAMS. SAVVY STUDENTS. “Students understand the potential for health care career opportunities and are gaining experience in various settings earlier in their career,” Valster says. They’re also aware of the growing demand for health care workers, which is expected to climb 18 percent over the next 10 years due to demographic changes. REAL-WORLD EXPERIENCES. The Center for Community-Based Learning helps arrange service learning opportunities where students can test their interest in health care and other careers. The Center for Career and Professional Development helps students prepare résumés or hone interview skills for graduate programs as well. Here’s what eight recent Central graduates have to say about why they’re interested in the health care field and how Central prepared them for graduate study. Many Central alumni are already health care professionals. They include senior living facility administrators, nurse case managers, palliative care physicians, nuclear pharmacists, family physicians, endodontists, cardiologists and more. Why Health Care: In a story in the Des Moines Register, Lehr said her father was a doctor, but never really pushed her to enter medicine. “I kind of grew up in the clinic so it just felt like home,” she said—and that it was her love of science and fixing things that drew her to medicine. Now, she and her father work together in the same clinic.